Last month we released our newest tee, HOPE, in an effort to support those suffering in Haiti. 100% of the proceeds from every HOPE tee sold will go to that end… through March 15th. So if you were thinking you’d like to be a part of what Eyes Wide Open International is doing in Haiti to help, support and minister to those affected by the earthquake, this is your last call. 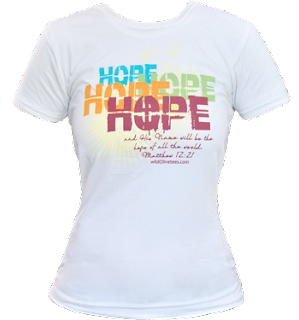 Additionally we’re offering a chance to grab a HOPE ‘bundle’: a tee for yourself and a tee to send down to Haiti. Both tees for $40. And EWOI’s next team, who will be traveling to Haiti very soon, will hand deliver every Wild Olive tee purchased. Just think how cool it would be to know, because of you, someone in Haiti is wearing a shirt with God’s word on it.